Acacia Lodge No. 16 in Clifton, Virginia calls itself "The Greatest Little Lodge in the Commonwealth of Virginia." 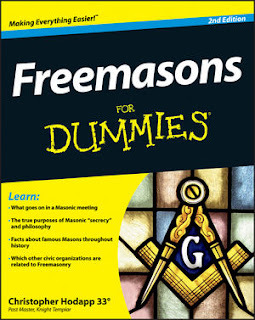 It was chartered December 11, 1877 by the Grand Lodge AF&AM of Virginia. But its historic building was severely damaged by flooding in 2006, and its taken lots of blood, sweat and tears to get it habitable again. On February 26th, Acacia officially reopened its doors, and Worshipful master Bobby new and his officers welcomed the community back in. “This is a great historic building, an important part of our community, and it’s good to see it opening again,” said former Clifton Mayor Jim Chesley, who stopped by with his wife, Jennifer. For two years, lodge members overcame financial and practical challenges as they rebuilt the historic Clifton landmark after two severe floods in 2006 and 2008 severely damaged the interior. “Our floors just buckled from the weight of 4 feet of standing water,” Morris said. Built in the 1870s, the structure was originally used as a mill on Pope’s Head Creek. The building was moved to its current location on Main Street in 1920 and has been home to Acacia Lodge ever since. In 1985, the lodge was designated an historic landmark by the U.S. Department of the Interior. The Acacia Lodge, like many historic landmarks, was sited below the floodplain, and the one-story building was vulnerable to flood damage. In 2008, when the second flood swamped the entire first floor, lodge members decided that it was time to completely renovate the structure. “To preserve the building, we had to put it on a lift and move it and then install a new foundation,” New said. The process of shoring up the foundation was arduous, and resembled the way beachfront homes are rebuilt after devastating hurricanes. First, workers poured concrete into the foundation to reinforce it, and then floodgates were installed to let water in and then drain out after severe storms. The Masons, who served as general contractors, also repaired beams and floorboards, constructed a ramp for handicapped accessibility and installed a new front porch. After the building was moved back to the foundation, a second-floor was added. Two handicap-accessible bathrooms were added to the first floor, and the new second floor contains the formal meeting room, as well as office and storage space. 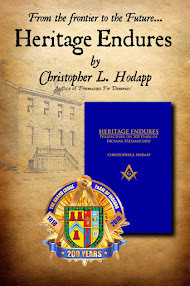 Throughout the two years of construction, the Masons met at the Henry Lodge in Fairfax. To raise the necessary funds for the $150,000 renovations, members and others interested in maintaining the historic lodge created The Acacia Foundation in 2007, a non-profit charity for the lodge. Well done, brethren. And welcome home. Photo: Moving-in day from the Acacia Lodge No. 16 website. New Novel: "The Mozart Conspiracy"
Robert Cooper's "The Red Triangle"